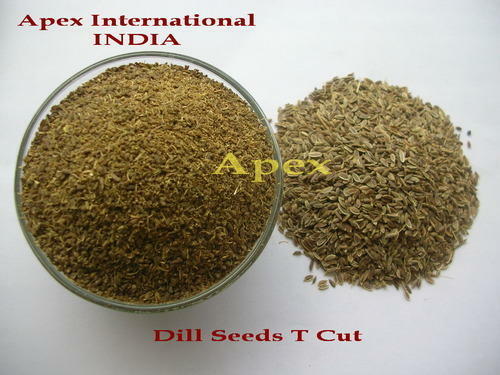 Exporter of Pure Anthem Graveolens TBC / Dill Seeds T Cut / Suwa From india. herbalists recommend combining dill and fennel to ease colic in infants. diuretic. Dill increases milk production, and when taken regularly by nursing mothers. Dill tea, made with water or white wine, is a popular remedy for upset stomach. for insomnia as well as for pains due to flatulence. We shall be pleased to receive your enquiries. Establishment in the year of 2005, we, Apex international, are listed among the popular organization affianced in the manufacturing, exporting and supplying Herbs & Medicinal Oil. Offered oils are processed from supreme grade ingredients sourced from the authentic vendors of the industry. Under this impeccable array, we are offering Medicinal Herbs, Natural Oils and Indian Spices. Offered products are highly appreciated by the customers for their longer shelf life, precise formulation and unmatched quality. To meet the varied needs and requirements of our clients in best possible way, we are proving these products in diverse packaging options. Apart from this, one can purchase these products from us at nominal market price. We export in Canada, USA, Latvia, Ukraine, Poland, Malaysia , China ,Japan, Serbia, Romania, Australia, UAE Etc Country. We are offering best quality products for our patrons since our inception. All our offered oils are checked against various quality standards under the guidance of our quality experts. We have built a top notch infrastructure unit to process our offered oils as per the set industry guidelines. Moreover, we have been able to fulfill the large quantity demands of the offered oils in timely manner.